Between the towns of Caracol and Jurema, in the small neighbourhood of Pitombeiras we saw just what a difference water can make and the damaging effects of what we call the drought industry. This was day three of our march against corruption in the dry, heartland of Brazil’s north eastern state of Piaui. On one side of the road was a plot of land, rich with produce that could clearly sustain a whole family. Barely 200 metres further on, there was a different picture: a lake without a drop of water and dry, cracked ground. 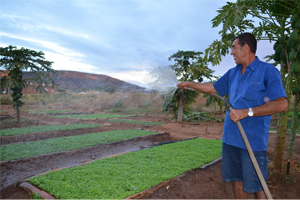 Lettuce, cabbage, tomotoes, peppers, melons and other fruits and vegetables, even flowers, can grow in the transformed soil of Piaui. This was all the work of Gisele and Thiago’s family. A few years ago Thiago dug a well and since then the family was able to start cultivating the property. 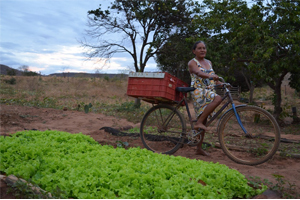 The result not only feeds the family but Gisele takes the surplus around the community on her bicycle and sells it. “We never got any help from the government. When the water runs out, I dig deeper. Today my well shaft is more than 11 metres deep,” said Thiago who added that his brother and his brother-in-law had also found water on their land and are now able to live off agriculture. Water allows the family to be independent. An independent citizen, according to Francisco, would not sell his or her vote. Someone who relies on government assistance to survive is much more easily influenced by politicians’ promises. Without water, people are dependent on the water trucks and those do not come regularly. This sad image of the cracked and dried out lake where families live in hope of a water delivery was made even worse by the fact that across the lake there’s actually a pump. We were told by the villagers, however, that it has never brought up a single drop of water. “This is not just a problem of a dry climate; it’s a problem of bad management of public resources, corruption and inefficient administration. 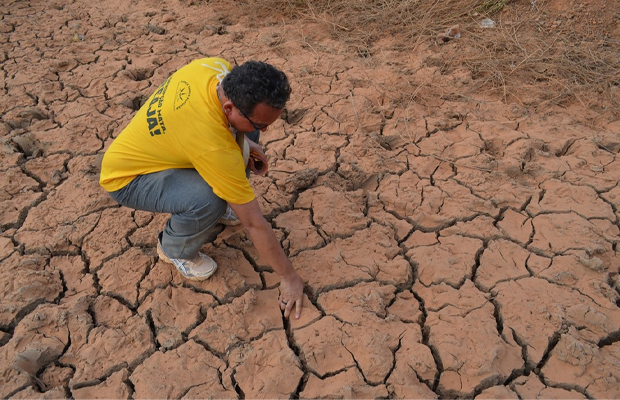 We’ve come across abandoned public works proving that drought and hunger are the result of poor governance,” reports Arimatéia Dantas, the founder and organiser of the march. In an attempt to improve these frustrating conditions, we have sent invitations to the authorities to come a public meeting to discuss the situation when we reach the end of our march in São Raimundo Nonato next week.